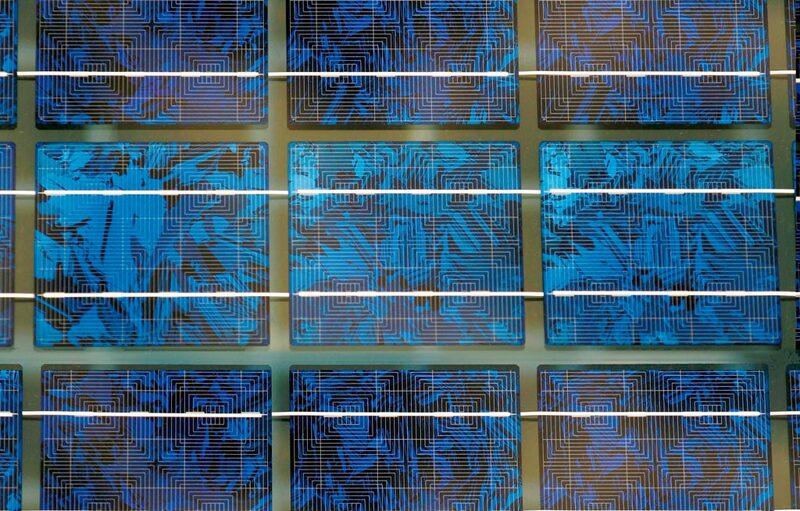 The 24 modules of glass-glass poly-crystalline photovoltaic panels have the capacity to produce electrical energy to power diverse uses in the building. The modules are symbolically integrated with the façade design and also function as an additional visual filter for some interior spaces of the building. 72 m2 of the high-tech Vitosol 200 vacuum tube solar collectors are installed on the roof of the building. 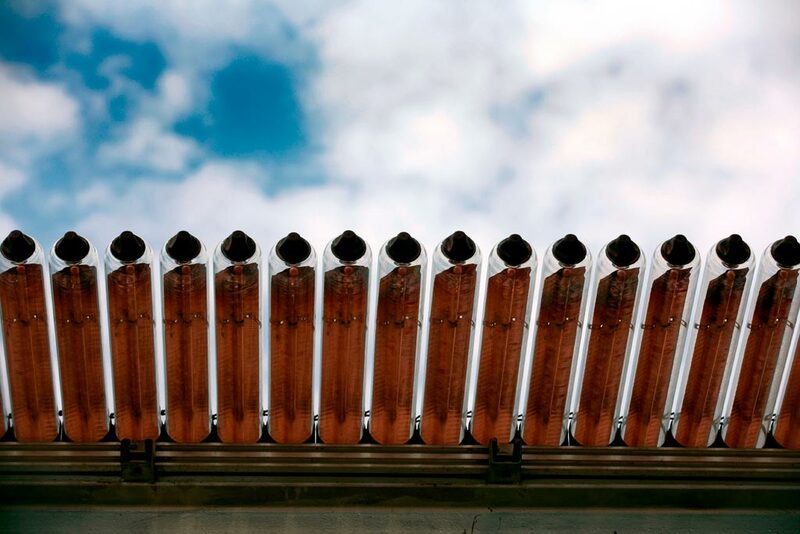 These solar collectors heat water that is stored in large well-insulated tanks of 6000-litre capacity. 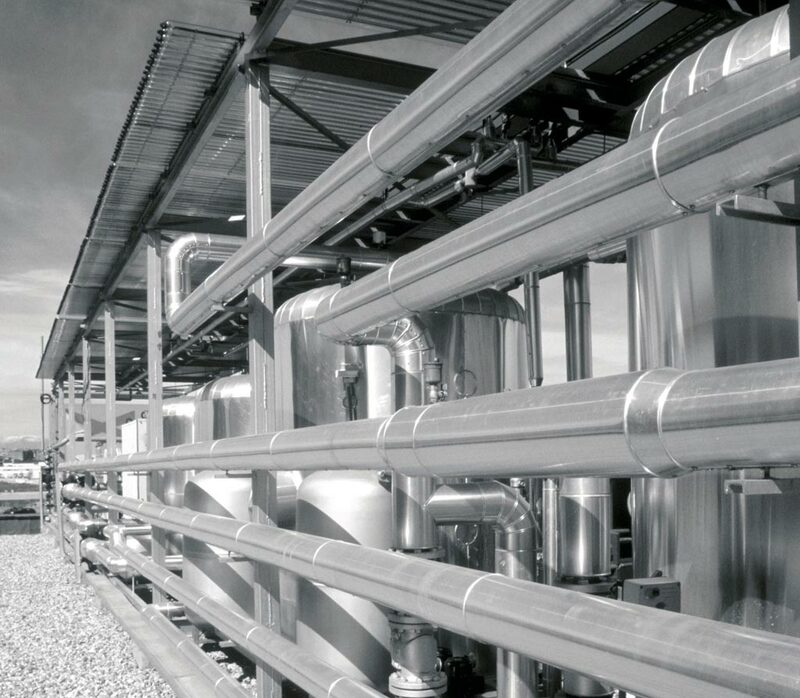 In the summer months, the vapour absorption chiller uses the latent energy from the water heated by the solar collectors to generate cold water. Thus, the solar panels continue working throughout the year. All the equipment is visibly placed on the roof to create a transparent showcase of eco technology. The traditional system of radiant floors using tubes buried under the floor screed ensures an even temperature distribution in the entire building. The same set of tubes that are used to warm the building in the winter is used for cooling in the summer with the cold water generated by the vapour absorption chiller. 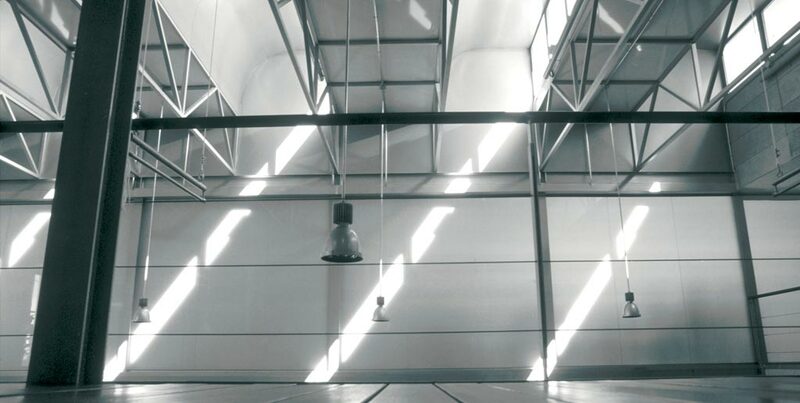 The floors and the ceilings are activated in the winter and summer respectively in order to optimize the circulation of air within the building. 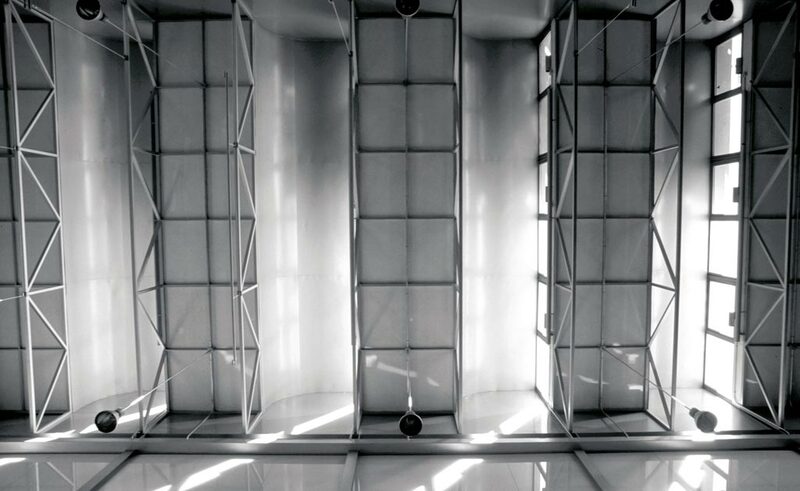 The cold water produced by the vapour absorption chillers and stored in two large tanks is circulated at the roof and ceilings of the different zones of the building. The water temperature is not allowed to fall below the dew-point in order to avoid condensation. A set of ceiling fans, powered by photovoltaic energy, helps to spread the cooler air and improve the thermal comfort during the summer. Are located underneath the building, within the walls and on the roof. The thermal storage materials (gravel and crushed stone) help to maintain optimal comfort conditions by absorbing thermal energy –heat or cold depending on the season– and releasing it slowly to the internal spaces. From the cylindrical air intakes located in the exterior, the outside air passes through the serpentine ducts located underneath the building. 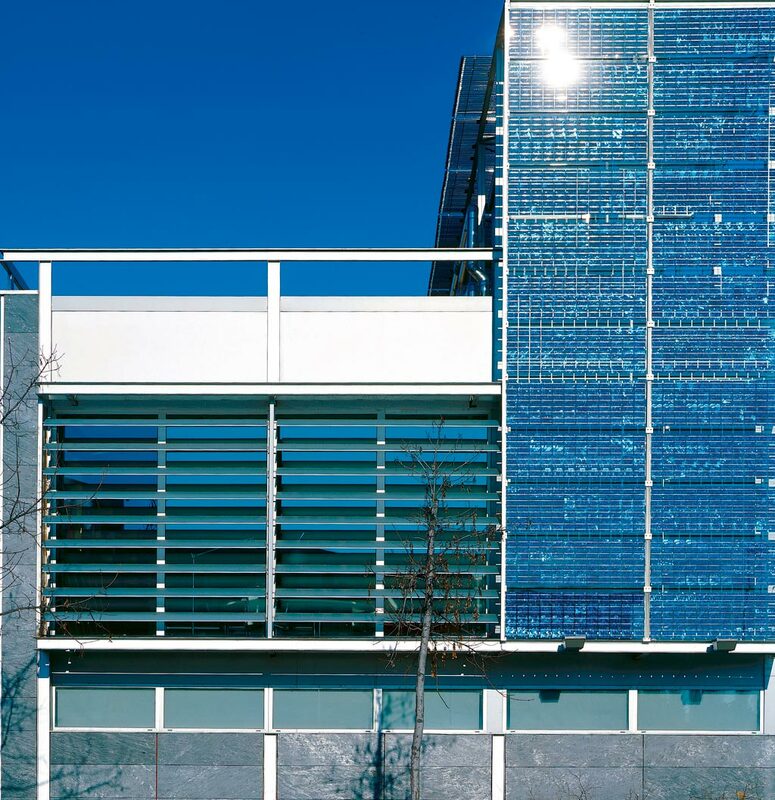 Here, the outside air exchanges thermal energy with the building’s main thermal storage mass whose temperature is naturally maintained at a constant 15ºC throughout the year. During the summer months, this naturally-cooled air is introduced via one set of ventilation ducts (blue system) to ‘recharge’ the thermal storage material (gravel) within the walls. 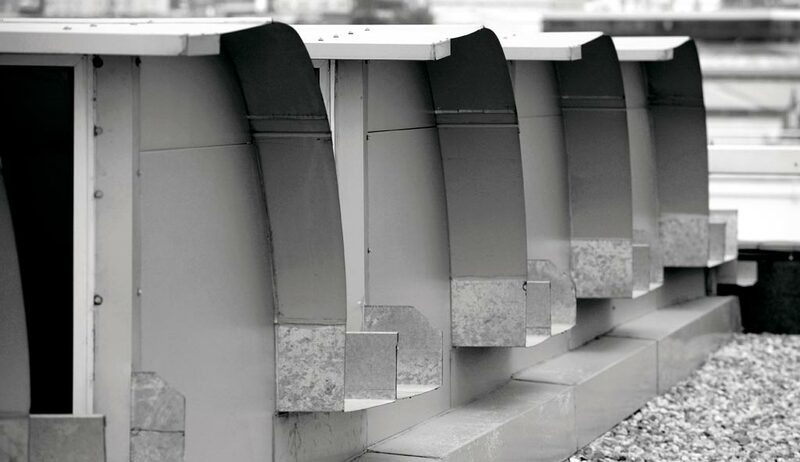 Another set of ventilation ducts (green system) introduces the naturally treated air into the building spaces at a comfortable temperature all year round. 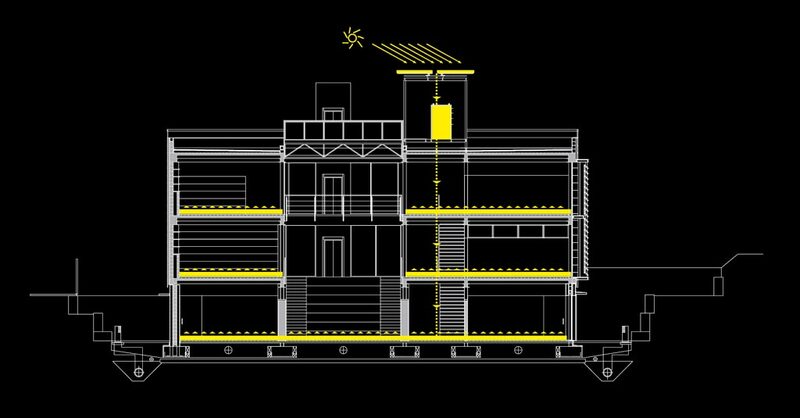 Permit the level of light entering the building to be regulated according to the season and personalised for each building zone. 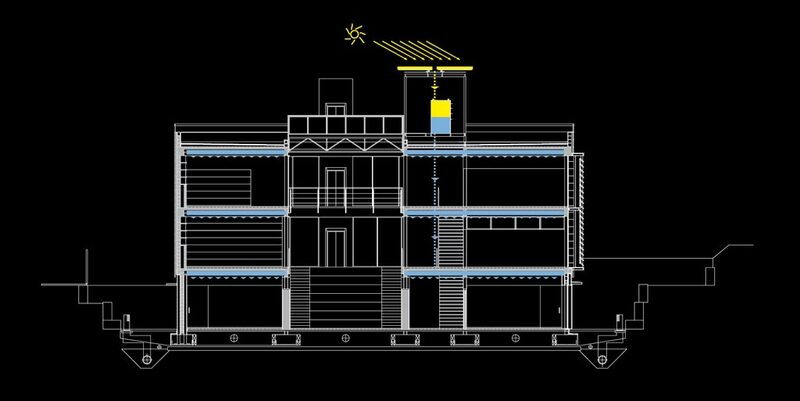 Thus, direct sun penetration into the building can be avoided in the summer while maintaining the possibility to capture solar energy in the winter. Allow light and heat to enter during the winter months, but the carefully calculated overhangs block direct sun penetration during the summer months. The sun scoops placed over the atrium space integrate an automatic window opening that helps the ventilation of the building when required. The building is ventilated by introducing outside air that has been naturally warmed or cooled by thermal exchange below ground. During the summer, when the air in the upper part of the atrium heats up, the atrium windows open automatically. 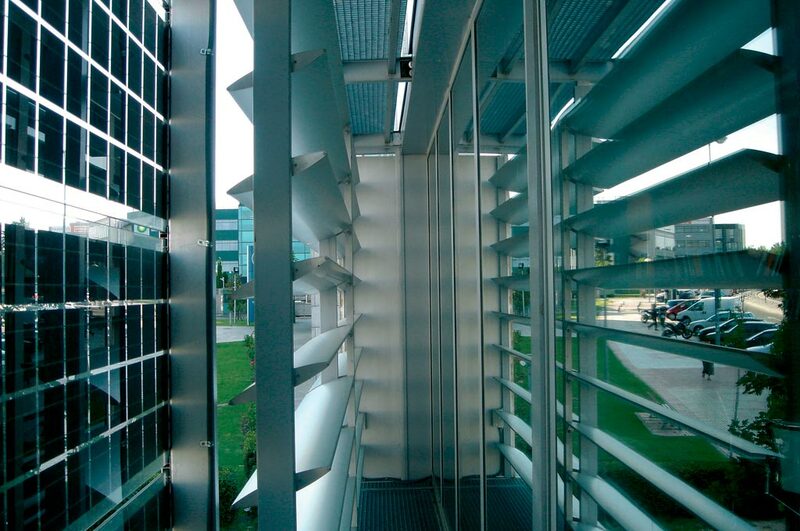 This generates a stack effect that helps maintain thermal comfort and the overall ventilation of the building. 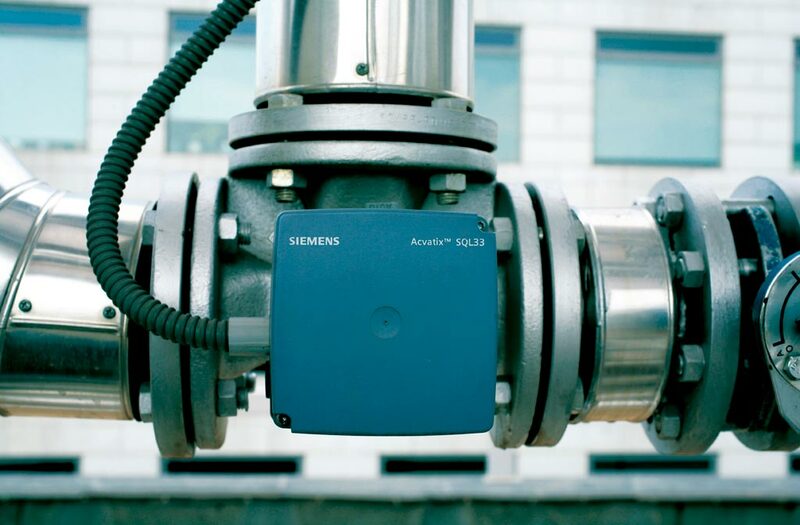 Siemens has designed an intelligent Building Management System that monitors previous demand, external thermal conditions and the solar energy accumulated in the water tanks located on the roof. The system is designed to make necessary adjustments to optimize comfort levels and to minimise the use of non-renewable fossil fuels.